On the subject of the electric charge, was learned that like charges repel each other while unlike charges attract each other. If a positively charged object is brought close to a negatively charged object, the two objects pull together so that they move toward each other. Conversely, if a positively charged object is brought close to a positively charged object, then the two objects repel each other so that they move away from each other. As studied on the subject of Coulomb’s law, electrically charged objects can accelerate other electrically charged objects because there is an electrical force acting between these electrically charged objects. The electric force that is exerted by an electrically charged object on other electrically charged objects is one example of a force that can act without contact. Another example of the force that can act at a distance is the force of gravity. The gravitational force is exerted by a mass object on the other mass objects. Friction force, thrust force, normal force are examples of forces that are easy to understand because these forces work when contact occurs. On the contrary, the electric force is an example of a force that is difficult to understand because this force can work from a certain distance without touch. To understand the electrical force that can act from a certain distance, appear the concept of electric field. The electric field concept was developed by British scientist Michael Faraday (1791-1867). Suppose a glass was initially electrically neutral. After being rubbed with a cloth, the glass rod becomes electrically charged. When the glass rod becomes electrically charged, at the same time an electric field appears around the glass. If the glass turns neutral, at the same time the electric field disappears. So the existence of an electric field cannot be separated from the presence of an electric charge. The electric field is not a kind of substance like air and not a type of wave, like electromagnetic waves. An electric field is something caused by an electric charge and affects space around an electric charge where other electrical charges only feel the influence of an electric field. To test whether there is an electric field in a room, it is assumed that there is a test charge in that space. The test charge is a minimal charge (Q) so that the charge produces an electric field that is very small so it can be ignored. However, the test charge can feel the influence of the electric field generated by other electrical charges. The test charge is presented only to investigate whether there is an electric field. If there is an electric field in the space, the test charge must experience the electrical force, while if there is no electric field, the test charge does not experience the electrical force. Look at the figure on the side. In figure 1, the charge +q1 and the charge +q2 produce an electric field in the surrounding space. When the test charge +qo is placed at a point in space, the test charge +qo experiences the electrical force. F1 is the electric force that is exerted by the charge +q1 on the test charge +qo, and F2 is the electric force exerted by the charge +q2 on the test charge +qo. In Figure 2, when the test charge is removed, the electric field remains and does not disappear from that point. E1 is an electric field produced by an electric charge +q1, and E2 is an electric field produced by an electric charge +q2. The electric field is a vector quantity, where the electric field has a magnitude and direction. The magnitude of an electric field is usually referred to as an electric field strength. The strength of the electric field at a point is defined as the force of electricity exerted by an electrical charge on a positive test charge placed at that point, divided by the size of the test charge. The unit of the electrical force is Newton, and the unit of the electric charge is Coulomb so that the unit of the electric field is Newton / Coulomb, abbreviated as N/C. 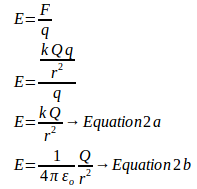 In Figure 1a, a positive electric charge (+Q) exert the electrical force on the positive test charge (+q), where the direction of the electric force (F) is away from the charge of +Q. In Figure 1b, when the test charge is removed, at this point there is an electric field (E) which its direction is away from the electric charge Q. 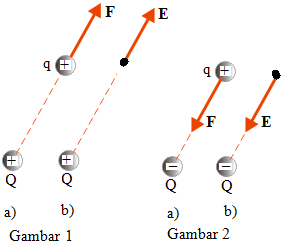 In Figure 2a, a negative electric charge (-Q) exert the electric force in a positive test charge (+q), where the direction of the electric force (F) approaches the charge -Q. In Figure 2b, when the test charge is removed, at this point there is an electric field (E) whose direction is close to the electric charge -Q. 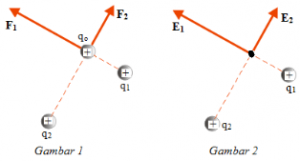 Based on the figure and explanation above, can be concluded that the direction of the electric field is away from the positive electric charge and approaches the negative electrical charge.